.... or how I missed PRing by 38 seconds and lost $10. Today's race started out like many others. I forgot to set my alarm last night, but was awakened at 5:50 AM by my son. Good thing too, as my cab was scheduled to arrive at 6:15 AM to take me to the 7 AM race start. This left me with 25 minutes to dress, eat, go to the bathroom, and get out the door. While trying to let the rest of my family sleep, I scarfed down a banana, chugged some water and coffee, and made it to the race starting line with less than five minutes to spare. This race was an all-women's (mostly) half-marathon that is part of the Run Like a Diva series. There are over 3,000 runners that create a frothy pink tide of tutus doing the half-marathon, and another several thousand that do the 5K version (the 5Kers tend to dress even fancier). In the home stretch of the race you are given a tiara and a pink feather boa, and finishers are greeted by shirtless firemen who place a bejeweled medal around your neck and hand you a single long-stem rose. The first "refueling" tent offers you champagne in a fluted plastic glass. Sound ridiculous? Yes. Sound fun? It definitely is. While this type of event is not something I would gravitate to on the natural, I do appreciate the camaraderie exhibited by all the women who are racing, the course is flat and scenic (it hugs the edge of the SF Bay), and the event is held less than 10 miles from my house. A complete win - win - win as far as races go. The Bay Area has been in the midst of a heat wave for the last few days, so I was glad to have an overcast sky and 60 degree temperatures this morning. Unfortunately, the cooler weather also brought with it a nasty wind that either felt like a head wind or a cross wind for most of the race. Several times I had to bow my head and really lean into the buffeting wind, which felt like the equivalent of running uphill. The frequent water/gatorade stations, and course entertainment (DJs, Taiko drummers, cheerleaders, volunteers and spectators) helped to keep me motivated on some of the longer and windier stretches. I surprised myself by actually feeling pretty good once I had suffered through the first three miles. I was in a log thin line of runners that had broken from the pack almost immediately and for the most part we held our positions for the entirety of the race. With eight miles behind me, I did the math in my head (which is always extremely difficult for me to do while running) and realized that, despite the wind, if I kept on pace I could PR. I wouldn't get the time I had been hoping for when I signed up for the race and had the best intentions of training hard, but a PR was within reach nonetheless I stepped it up a little and managed to pass a woman that I had been trailing for the majority of the race. Then came mile 10. The stretch between mile 10 and 11 seemed endless and I really felt the difference between being generally fit versus well-trained. I simply did not have the mojo to keep pushing the pace for the last two to three miles. Sadly, the end result was that I finished 38 seconds behind my PR. Knowing that, I am of course second guessing inefficient water stops, and the times I slackened the pace to tame a churning stomach. But actually I know the reality is that I simply had not put in the time and effort needed to make that PR happen. We can off-the-couch-it to some degree and it will get us close, but like with anything else, you have to actually put in the time to improve. 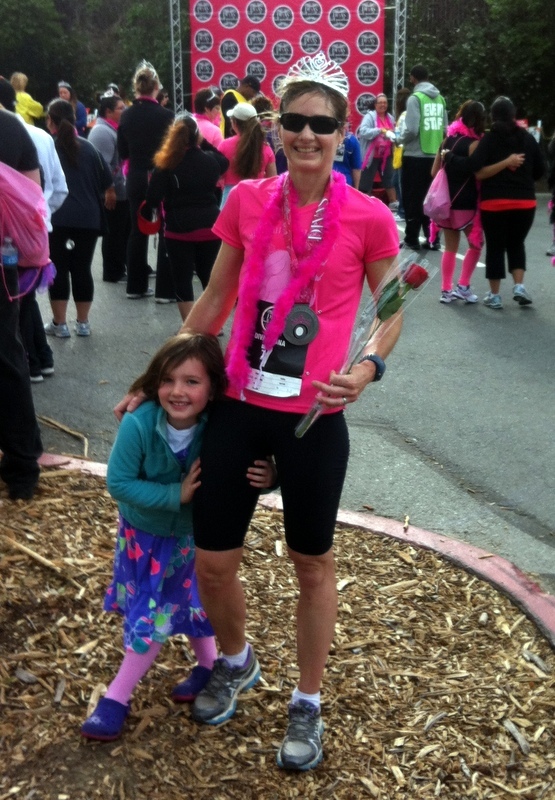 That being said, it was still very inspiring to run with fast women and I was thrilled to meet my family at the finish. The rest of the day is filled with birthday parties and play dates, but that 1:37 this morning was for me, and that in itself is a victory. ...oh, and the $10. That was the change from my cab fare that fell out of a pocket somewhere along the course. Hopefully some lucky Diva found it and is buying herself a really fancy pink drink with the money now to celebrate her accomplishment. Cheers!